Dreamers Update! What a year! To say this year has been a whirlwind would be an understatement. One year ago, we introduced Dreamers Coffee. Our very first purchase was from our dear friend Mary Wasserman. She believed with us day one. She knew this much, we were going to teach the world. Mary has been a mentor and teacher to me over the years, so her purchase meant the world to me. When she got her bag of coffee she was thrilled with the packaging, and so happy we had chosen coffee that everyone gets paid all the way down the line! To this day, I would say that Mary has been my biggest influence in my Ds journey. I was/am so proud that she was the very first person to purchase Dreamers Coffee! The very first gift package was bought by my absolutely dear friend Dr. Jennifer Smolka! I was not shocked. This woman has worked tirelessly to advocate for individuals who have Down syndrome. 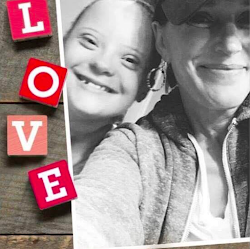 Her entire life has been dedicated to this on behalf of her son who has mosaic Down syndrome. I could not have been more thrilled that she purchased the very first gift! Her 321 eConference is such a blessing to so many families! Can you imagine, all of the information you want to learn, from the professionals you want to learn from, and you don't have to travel. I love her forward thinking, and I believed in her day one! I had a dream that I would open a coffee house, in which I would employ individuals of all abilities. So I sold bags of coffee. It sold in a big way. So much coffee went out that we needed to adjust to our new plan. Many were asking me if they could sell Dreamers. Of course I wanted them to, I just had to figure out how to do this. We have figured it out, and we are so excited that Dreamers is being sold in 11 states and we have 3 more states who will be joining us! Our coffee blends are top notch, and people are seeing that we definitely have amazing coffee! So thankful for our awesome roasters at J. Brooks and Furnace Hills!! Both of our roasters believe in our mission. I could not ask for more! Locally, we are having a blast! We will be at the Collierville Sunset on the Square every Thursday!! We are so excited to be there! We hope you will come on out and listen to some of your favorite bands, and stop by and see us! We also hope you check out the golf at Vantage Point Golf Center! Have you seen their new miniature golf course! It is amazing!! And beautiful! And Pleasant! And safe! Please come on in and have a cup of amazing and delicious iced coffee before or after you hit some golf balls. We are also out at Clara Morgan's in Southaven! These ladies are having a blast sharing our mission and helping create jobs!! Their passion is amazing! They get this! What ever you do, come on out and taste our amazing coffee. Meet our amazing Dream Team! Every time you purchase a cup of coffee, you help us employ individuals of all abilities. Thank you to each and every one of you who have done just that. This entry was posted on Wednesday, June 1, 2016. You can follow any responses to this entry through the RSS 2.0. You can leave a response.